A recent article in Politique Européenne by Maarten Hillebrandt (Bielefeld University) deals with the question of the development of transparency policy in the Council of the European Union. The development path of transparency in the Council is often regarded by outsiders with scepticism. After all, before 1992, the EU’s most ‘intergovernmental’ institution was known for its pervasive diplomatic secrecy. According to insiders, twenty-five years on, continuous external pressure would have made the Council considerably more transparent, in spite of all its resistances. This characterisation of a transparency-hostile Council overrun by external ‘transparency forces’ may however be too schematic. Following Meijer (2013), the article revisits the evolution of the Council’s transparency policy over time, analysing it as a reflexive arena consisting of different levels: the strategic, the cognitive, and the institutional. Viewing transparency policy in this manner, the article argues, allows for a deeper understanding of the complex, fragmented and interlocking patterns by which the Council sometimes enabled, sometimes constrained attempts to advance transparency. As it turns out, transparency policy developed in a multi-speed mode. This perspective partially displaces the account of the Council as a transparency-hostile and inert institution engaged in zero-sum games with its environment, and challenges the understanding of Council transparency preferences as being monolithic and static. Yet it also focusses attention on the normatively problematic notion of institutional adaptation through informality. 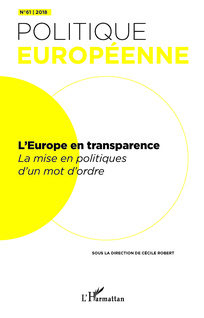 The article forms part of a special issue around the theme of transparency in European politics and policy. It can be accessed here (doi: https://doi.org/10.3917/poeu.061.0142). This entry was posted on Saturday, January 5th, 2019 at 11:52 pm	and is filed under Research. You can follow any responses to this entry through the RSS 2.0 feed. Responses are currently closed, but you can trackback from your own site.